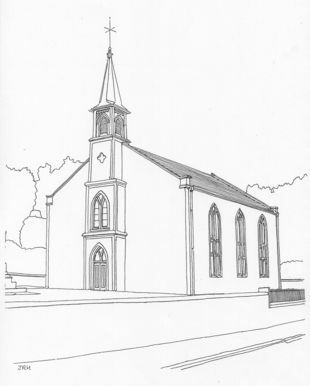 Rectangular-plan plain Gothic church with 4-stage square tower and spire on the south gable. The church is dated 1826 and was probably designed by John Smallwood. Inside there is an octagonal pulpit with sounding board central on the west wall and a panelled gallery on three sides supported on slender cast-iron columns. Organ, 1907, by The Positive Organ Co Ltd. Eskdalemuir is well known for its Meteorological Station, and the Samye Ling Monastery & Tibetan Centre. The largest Service in the year is the Christmas Carol Service, attended by locals, members of the Langholm, Ewes, and Westerkirk Churches, together with Buddhists from Samye Ling.